Share the post "4-H Robo Expo Co-sponsored with School of Engineering"
The first “4-H Robo Expo” was held in collaboration with the Rutgers School of Engineering during the annual Rutgers Day Ag Field Day activities on the George H. Cook Campus. 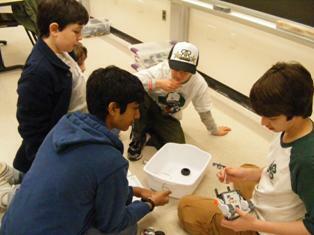 The objective of the event was to offer a state-wide event for the members of the 4-H robotics clubs. Thirty-six youth and their parents, drawn from Hunterdon, Somerset, Union, Camden, Middlesex, Mercer, and Cape May counties participated in the event. At left, youth participate in SUGO—Sumo wrestling with robots built and programmed using LEGO NXT. Youth participants build the robots and then have a competition to see which robot pushes the other out of the playing field, just like Sumo wrestlers.